Give an old linen dress a new look with dye. A dress made from linen fabric has its pros. It’s lightweight and cool, with a crisp, fresh appearance. But is also has its cons, most notably a tendency to wrinkle after only a few hours of wear. If you want to dye a linen dress a new color, you’ll discover another of the fiber’s benefits – it readily accepts dye without too much fuss or special supplies. Linen is woven from fibers derived from the flax plant, a cellulose fiber. 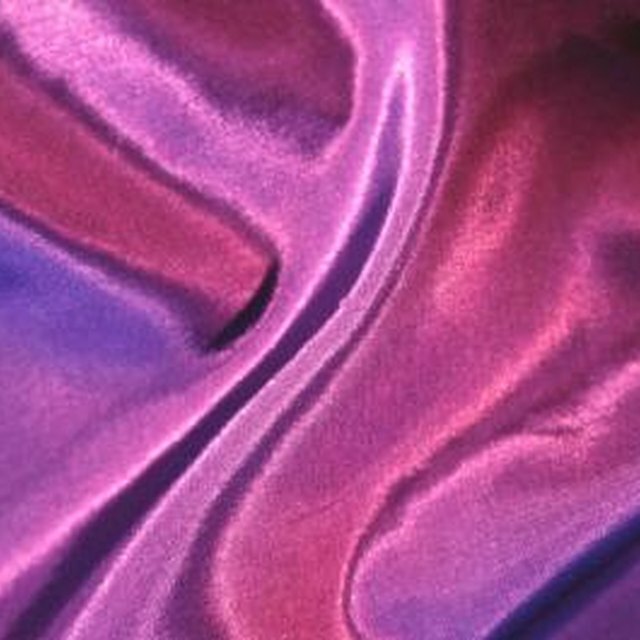 Cellulose fibers are dyed most successfully using fiber reactive dyes. Choose a dye color darker than that of the dress, and launder the dress immediately before starting the project. Measure 1/2 teaspoon of fiber reactive dye and about 1/4 cup of warm water into a jar, wearing rubber gloves. Stir the dye into the water with a craft stick or plastic spoon until it is fully dissolved and the solution is smooth with no lumps. Add 1 cup of warm water to the solution and stir again. Pour 1 1/2 gallons of cold water into a bucket. Pour the dye solution from the jar into the bucket and stir with an old wooden spoon. Be careful not to splash any of the dye solution onto nearby surfaces. Stir 1 1/2 cups of non-iodized salt into the dye solution until it has dissolved. Remove the damp dress from the washing machine. If the dress has dried since you washed it, rinse it under cold water and squeeze out the excess so that the fabric is damp. Lower the dress carefully into the bucket of dye solution. Stir the fabric around so that it gets thoroughly saturated. Continue to agitate the dress in the bucket with the old wooden spoon for about 20 minutes. Combine one cup of warm water and 8 teaspoons of soda ash in a jar and stir until the soda ash has dissolved. Move the dress to the side of the bucket with the spoon so that you can pour the soda ash mixture into the dye solution without pouring it directly onto the fabric. Add the soda ash solution to the bucket slowly, a few splashes at a time, over a total of about 10 minutes. Stir the dress around frequently for the next 30 minutes to an hour, depending on the final shade you desire. Lift the fabric out of the dye solution every 10 minutes or so to examine its new color. Remove the dress from the bucket when you see a shade you are happy with. Squeeze the excess liquid back into the bucket. Take the dress to your sink and rinse it under cold water until the water runs clear. Wash the dress in your washing machine, by itself, using a hot water setting and the usual amount of laundry detergent. If you are using black dye, double the amount of dye to use and the amount of salt you add to the bucket. You can also use extra dye to get a more intense version of any color. Soda ash, also known as sodium carbonate, helps “fix” the dye to the linen’s fibers and prevents it from washing out or fading over time. It is available in the laundry section of some supermarkets, craft stores and pool supply stores. Soda ash and fiber reactive dye are caustic chemicals, so work in a well-ventilated area and seal the containers as soon as you have finished using the products. Cover your surfaces and wear old clothing and an apron when working with dye. Clean all the surfaces and supplies as soon as you have finished the project, and clean up any spills immediately.